Remaco BKT-572 is our very first heavy-duty ceiling bracket in our wide range of bracket products. Slim but durable, BKT-572 is only standing at the size of 18cm x 150cm(W x H). Manufactured with high quality metal, it is so durable that the maximum load withhold up to 85kg. With Pan Angle of 360 degree, there's no reason to resist anymore. Suitable for screen Size 26" - 65" LCD TV / Monitor. Picture shown below is for marketing purposes only. BKT-512 is not included. Remaco BKT-520 is beautifully powder-coated with metallic silver finishing. With it's "2 in 1" concept allow users to tilt and set either 0 or +5 degree simply by removing the tilted part of each of the universal brackets. Simply as that! 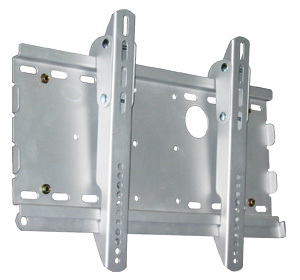 Designed with a securing plate, it acts as a double protection of your Plasma or LCD TV after installation. Furthermore, theft could also be prevented while leaving it unattended by inserting a padlock on flat rod by itself. With a maximum load capacity of up to 80kg, it is further evident of the durability of its metal structure. Recommended screen size: 30" to 42".